Back to "Work Begins Again . . ."
Spring/Summer 1999 Westford Covered Bridge update: The Westford Historical Society successfully competed for another Intermodal Surface Transportation Enhancement Act (ISTEA) grant through the Vermont Agency of Transportation this past spring, said Caroline Brown, society president. "This 80/20 matching grant was in the amount of $60,000," she said. "The Historical Society was able to apply for this amount because of a generous donation made to the society. The Society is in the process of putting together a request for bid proposal and is looking at a late fall or springtime return of the bridge to the Browns River abutments, weather and river conditions permitting." The story of the bridge began when voters in Westford resolved in 1836 to build a single arch bridge over Browns River for a cost not to exceed six hundred dollars. 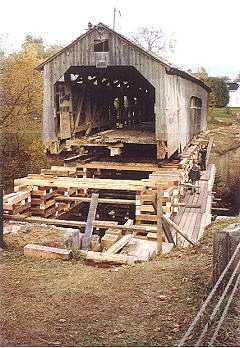 The bridge was originally part of the Vermont Market Road ordered built by the Vermont Supreme Court in 1827. Workers finished construction of the bridge in 1838, but the road project as a whole was never completed. The story of the saving of the bridge had its beginnings in 1987. In February 1987, Westford residents called a special meeting to save the bridge. The Westford Historical Society was formed. Graton Associates of Ashland, New Hampshire was selected to do the restoration. The Gratons advised that the bridge should be removed from the river before winter, it being in danger of collapse. Work began in October 1987. 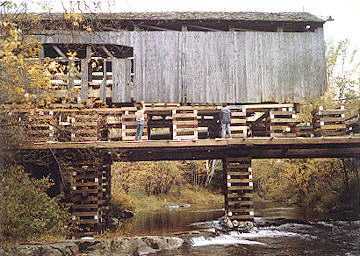 Graton raised the bridge on timber cribbing and built false work under it. While residents stood in rain and mud to watch, a team of oxen pulled the bridge off the river on log rollers. 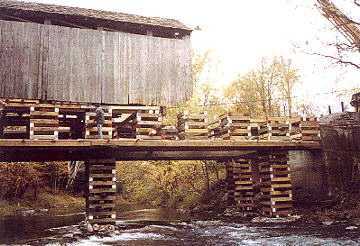 Then Graton used his tractor-trailer truck and the town's bucket loader to move the bridge uphill to the town garage property The National Geographic Society filmed the operation for a documentary on Milton Graton's life as a bridge restorer. Also filming the event was a crew from the America-How-Are-You TV series. The bridge was restored where it stood next to the town garage. There it remained when the project went on hold waiting for funds. WESTFORD - November 9, 1992- The Brown's River covered bridge at Westford is ready to return to the river from where it came. However, funds are required to repair the abutments at the original site on Brown's River, and to move the bridge from the town garage property where it was situated for the restoration work. When the bridge is back on its abutments, the three inch thick floor planking will be installed, said Westford Historical Society President Caroline Brown. "When the curve of the bridge is back in place after being set on site, the side boards will be trimmed." The ninety-seven-foot span was in service until a concrete and steel bridge replaced it in 1965. After 127 years of continuous use, the old bridge could no longer handle modern traffic. In 1976, after years of abandonment, the townspeople and the reserve Seabee battalion from Burlington repaired the bridge for the National Bicentennial. The repair work did not include fixing the wooden arches, rotted where they met the stone abutments, so the old bridge sagged noticeably in the years following. It was closed to foot traffic in May 1987. WESTFORD - March, 1995, - The Westford Historical Society has received a $36,000 grant from the Agency of Transportation through the federal Intermodal Surface Transportation Enhancement Act (ISTEA) to complete the project by replacing an abutment, moving the bridge back over the river, and landscaping the area. The grant paid for 80 percent of the completion costs. The balance of the funding was raised by the Historical Society. 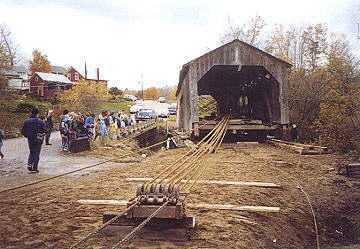 The society worked four years to raise money to restore the bridge without cost to the town government--the moving of the bridge and the restoration, the first phase of the project, cost $50,000. Funding came from community fairs, ham suppers, grants and private donations. October 1, 1998 - The Bridge still stands on the hill next to the Town Garage overlooking the vacant abutments. Much has happened since the autumn of 1992. Progress was halted by the need for state permits, then the passing or moving on of key people in the project, and now, higher costs. Caroline Brown is still working toward the goal of putting the bridge back where it belongs, asking for bids from contractors to complete the work. WESTFORD - November 12, 1998 - The Browns River Covered Bridge stands alone in the tall grass on the hillside overlooking the village. 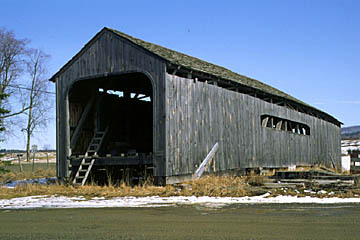 Ready since the fall of 1992, Westford's covered bridge has been standing in the town garage lot where it was restored. The project is on hold awaiting funds to move the old span back over the river. "It's not just sitting up there forgotten," said Caroline Brown, Westford Historical Society president. "It is being worked on through paperwork. It's a project that the town folk would really like to see finished up." Asked what has held up progress in completing the project, Brown replied that it has been the long process of writing the grant, assembling the bid proposal paperwork, getting the abutment design and then getting the packages out to the contractors. "We thought completing the project was going to cost roughly $45,000, using the original grant money then, when we went out for bid proposals from the people who do the work, we found out we didn't have nearly the amount of money needed." The Historical Society received a $36,000 grant in 1995 from the federal Intermodal Surface Transportation Enhancement Act (ISTEA) through the Vermont Agency of Transportation (VAOT), and the state is currently holding this money. The grant was applied for by Kathlyn Robie, then the society's treasurer, said Brown. The $36,000 is 80 percent of the total amount of the 80/20 matching grant of $45,000. The Historical Society is currently preparing an application for a second ISTEA grant to get the balance of the funds needed to repair the abutments and move the bridge back over the river. Grants are awarded in March. "It's a project the Historical Society committed to years ago and the town has had a lot of patience," said Brown. "We pledged that we would not ask the town for any money through taxes, so it has taken a while. We were very fortunate to get the first ISTEA grant, we'll be doubly fortunate to get the second one, so we can finish this up and get the bridge back on site." The Society has worked since the Fall of 1988 to raise money to restore the bridge without cost to the town government--the moving of the bridge and the restoration, the first phase of the project, cost $50,000. Funding came from community fairs, ham suppers, grants and private donations. Currently working on the project with Brown are Historical Society members David and Lynn Gauthier, Daniel Jackson, and Lois Reynolds.